In a cup, melt the pink candy melts according to package instructions. Swirl and coat the top of a Pretzel Rod in the melted candy. 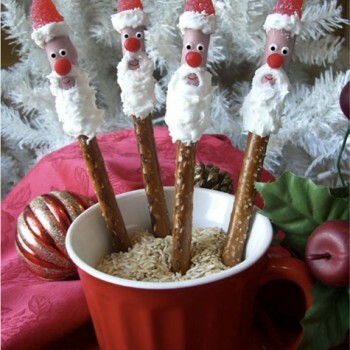 While still melted, place a gum drop on the top of each rod and stick on the red Décor for the nose; stand in a cup to cool. Squeeze additional white Easy Squeeze to form the “fur” trim of Santa’s hat and a little dollop to create the hat’s pom-pom. Stand the rods in a glass and place in the refrigerator for a few minutes. Using the black Writing Icing, squeeze a little on the white eyes to make the pupils. Using the red Easy Writer, draw on Santa’s mouth.